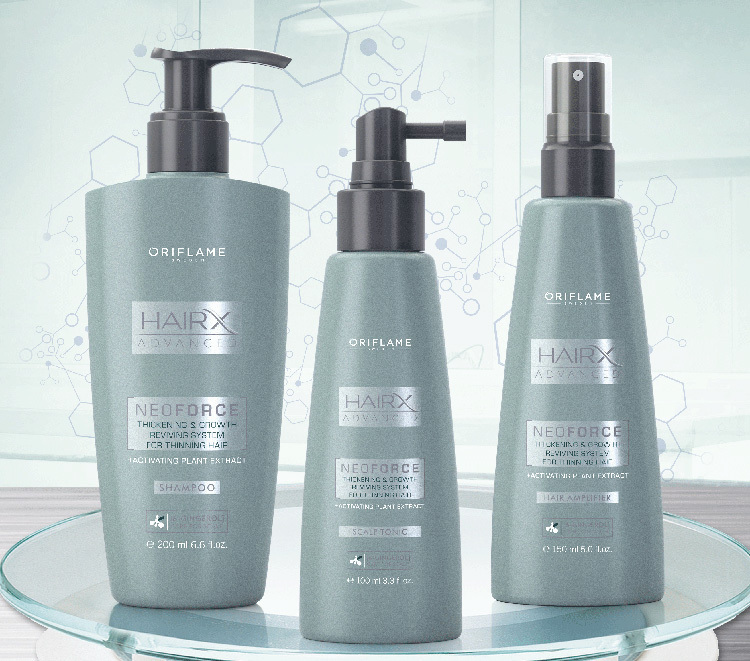 The HairX Advanced NeoForce range is a complete 3-step effective system with Vegetable Stem Cells for stronger, thicker hair by preventing hair loss and stimulating natural growth. This range contains the Reviving system , which combines the patented and innovative active “Hair Growth Reviving” with Ginger Oil for thicker, healthier-looking hair. “NeoForce technology contains patented active ingredients clinically proven to stimulate hair growth, while the Apple Stem Cell extract has proven results in delaying hair loss signals.” – Jane Collins – Trichologist / Hair Scientist Research and Development Oriflame. A daily shampoo that deeply cleanses excessive sebum and environmental residues, while helping to restore vitality to thinning hair**. Formulated with Plant Stem Cells, a Reviving System and 6-Gingerol. Leaves hair and scalp feeling cleaned and energised. 200 ml. An advanced scalp tonic that strengthens hair and prolongs hairs life cycle. Formulated with Plant Stem Cells, a Reviving System and 6-Gingerol to help stimulate healthy hair growth at roots for denser and thicker looking hair, in just 3 months** Apply twice daily. 100ml. An amplifying and conditioning spray that delivers an intensive volume boost for fuller hair texture*. Formulated with Plant Stem Cells, a Reviving System and 6-Gingerol. Leaves hair looking fuller, healthier and thicker from root to tip by simply spraying onto damp hair. * Self-assessment of 85 men and women with weakened hair who used the full range. Apply the spray to damp hair and style as usual. Tip: Dry with dryer for extra volume. 150 ml.